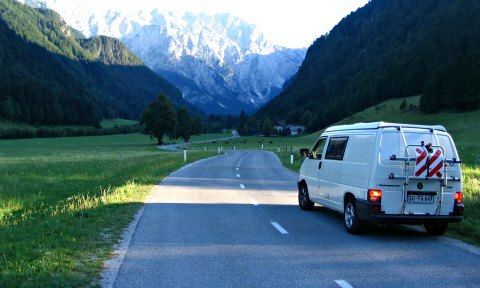 I often travel Slovenia in my camper van and explore this small and beautiful European gem. Some basic facts will come in handy if you wish to discover this amazing country, therefore I decided to put up this mini Slovenia travel guide for your future reference. A lot of people are simply surprised by the diverse beauty this country has to offer on such a small space. Slovenia lies in the center of Europe and if you were to visit the spectacular Croatian coast or even continue all the way down to Greece in your vehicle from central Europe, well, you'll pass right through it. This is one of the smallest European countries with only two million people living here, yet it has just about everything you can imagine combined all in one small piece of land. It is the only country in Europe where four major geographical units meet, the Alps mountain range, the Karst region with world famous underground cave of Postojna, the Pannonian plains and the Mediterranean world which goes by the name of the Adriatic sea in these parts of the world. All this diversity in the height of the mountains, the depth of the lakes, rivers, the sea and ancient forests reflect in a astonishing variety of climate, vegetation and culture. All these facts play a major role of importance when you travel Slovenia. Travel Slovenia will take you to the borders with Italy, Austria, Hungary and Croatia, where Slovenes living in these parts, naturally speak at least one foreign language. And of course English is widely spoken or at least understood for the sake of common sense. All that within a short driving distance from one point to another. In fact, just take a slow and enjoyable round trip and you'll be just fine. If time allows, you can spend days, weeks or months discovering what a travel in Slovenia has to offer. Slovenia is as green as only pure nature can be. And I'm far from kidding here. A lot of folks visiting the country from other parts of the world are absolutely stunned by the scenery. How do I know all that? Oh, just forgot to tell you, I actually live here. 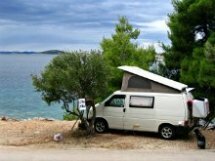 There are about 50 camping sites scattered around and you can get a map of Slovenia with camping site locations, along with loads of other information you might need in any tourist office, camping site or similar facility around the country. 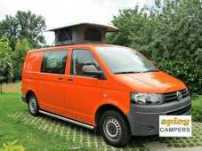 Most of the camping sites offer or are close to hiking and cycling paths, swimming in the nearby lake or river, kayaking, canoeing, climbing, paragliding and so on. There's hardly anything missing here. Some of them are open all year round and you can even find a few close to one of the many ski areas. 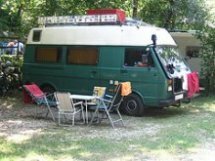 The camping site in the Capitol of Ljubljana for example offers a large and modern water park and excellent bus connections to the center of one of the smallest and prettiest capitols in Europe. Well let's take a look at this brief travel guide just to discover some of the most important facts you need to know when you travel Slovenia. If you appreciate what the nature has to offer, this small piece of land will more than satisfy your appetite with its biodiversity. We love our mountains and the water as the country is one of the richest European spots as far as natural water is considered. When the snow melts, it's hut to hut hiking and climbing time. 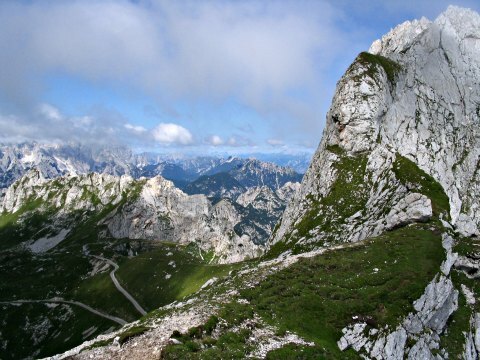 The Julian Alps, Karavanke, Kamnik Savinja Alps and Pohorje cover a large area of the north and northwest part of the country and are of course favorite getaways for the lovers of nature. I believe that over 10.000 kilometres of marked hiking trails will more then satisfy your hiking desires. When you travel Slovenia, be aware of the fact that some of the best world wide known athletes were born in this small country. Well, they do live in a country that inspires sports such as cycling, mountain climbing and skiing! This small country is a lot about having an active outdoor adventure packed experience. Top that of with a soothing thermal water treatment in one of the many Spa resorts around the country to relax your body and soul. Hiking - Hut to hut hiking and climbing for as long as you want. There are lot's of hills and mountains immersed in outstanding nature for you to walk at and if time allows, you can actually walk around the country for weeks. Cycling - The country is all covered with cycle paths and tracks. Mountain bike or street bike is just a matter of your choice and the area you choose to explore. Cycling maps are of course available just about everywhere. Water Adventure - Wild water kayaking, rafting or even canyoning are all sports a country full of sparkling clean mountain water can offer. 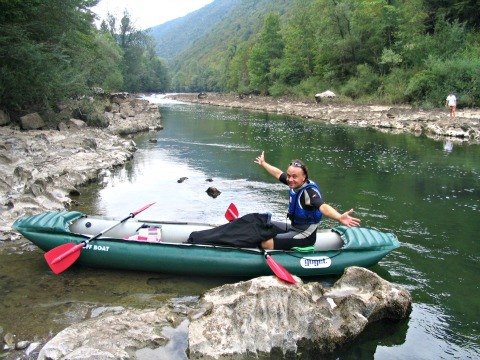 The lakes, rivers and the Adriatic sea also offer easy canoeing or kayaking trips, just in case you're not an adrenaline junkie. Paragliding - Due to the diversity of the landscape, you will find quite a few paragliding spots well known around Europe and the rest of the world. Competitions are held here guys and girls, so if your into it, don,t miss it! Skiing - there are around 80 ski areas also covering lots of cross-country tracks, some of them just made for pure extremists. Slalom championships from Krajnska gora and Maribor are well known around the world. And don't forget the ski jumps from Planica, an every year event with a long tradition and a worldwide coverage! Thermal waters - Don't forget the healing factors of what the nature has to offer. Thermal waters were first discovered by the Romans here, and even today, a long list of thermal resorts is available. Give your body and soul a treat, thermal waters really do relaxing wonders. Young and enthusiastic groups like Adventure Slovenia will show you the country in a more organized and individualistic approach tailored out for your needs. And if all this is not enough you can always take a dip at the Adriatic sea or explore the world famous Karst cave, Postojnska Jama. For 140 years, this has been the worlds only cave offering a special train ride in the under world, a world of spectacular limestone sculptures and arches. This is a very educational an hour and a half long discovery ...something you should not miss! According to the EDEN awards ( European Destination of Excellence), the following three destinations are the best this amazing country has to offer. Take my word for it, all these destinations will empower your travel Slovenia experience with the extraordinary landscape. Living quite close to the area, one of my favorite spots is the valley of the Soča river, also known as the Emerald river with the Julian Alps that surround the valley at the north part. This exceptionally clean and emerald colored river begins it's path in the heart of the splendid Triglav National Park and the Julian Alps, runs by the Italian/Slovene border and finally flows in the Adriatic sea near the lovely Italian summer resort Grado. The valley itself is of exceptional beauty and driving up towards the small towns of Kobarid and Bovec is just something that can totally clear my mind from the dust we have been exposed to. When you travel Slovenia, you can easily escape the crowds within minutes when you really need to chill out. And thousands of peace seeking travelers each year only prove this fact. Well known throughout Europe and abroad, this particular valley offers beautiful picnic-spots, numerous hiking paths in the surrounding mountains, lots of cycling paths, a well known paragliding area near the town of Tolmin and wild water rafting, kayaking and canoeing from the town of Bovec. There are also calm water spots available of course, like canoeing on the lakes Most na Soči, Lake Bohinj and Lake Bled if you don't have the wild adrenaline frequency in your veins. Did I forget to mention the fishing season? Don't miss it! 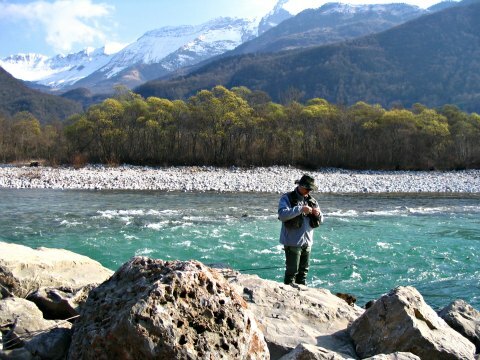 The Soča river is the home of the famous Soča marble trout and fishermen from all around Europe try their luck in this beautiful river every year. Certainly one of my favorite facts about Slovenia fishing tourism. Travel Slovenia in the fishing season, enjoy the trout and the many ways it can be prepared! Many mountains offer outstanding views of the Adriatic sea and the rest of the Alpine range all the way to Italy and Austria. Mount Kanin is one of the highest peaks around and offers excellent hiking and skiing between 2.300-1.140m above sea level height. It's probably the only mountain around where you can actually ski and enjoy the spectacular view of the nearby Adriatic sea all at once. It is also the only mountain where you can ski in Slovenia or in Italy as the ski lifts have been recently connected with the Italian Sella Nevea ski resort. Mount Kanin is a natural border between both countries of course. On the bottom of the Mt.Kanin lies the town of Bovec. The town and the Soča valley offer more than enough accommodation for every taste. 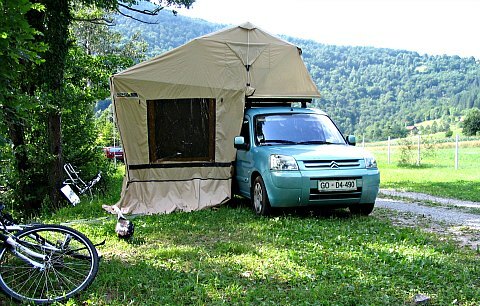 Small and attractive camping sites close to the river and private rooms, apartments and a few hotels all immersed in beautiful nature with breathtaking views. 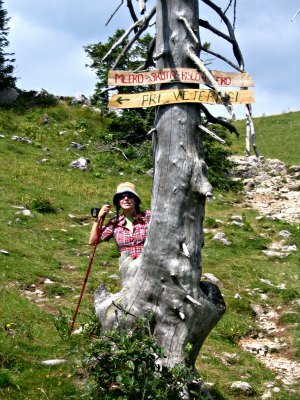 Every now and then, when I need some peace and quiet time, I pack up my Volkswagen camper and hike on The Velika Planina or hide in Logarska Dolina (Logar Valley). Winter or summer, it doesn't really matter. Velika Planina is just a short drive from the Julian Alps and not that far from the capitol of Ljubljana. The average height of around 1500m above sea level gives you more than enough fresh mountain air. 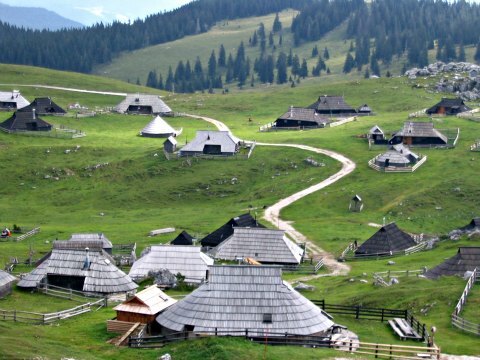 Located in the Kamnik Savinja Alps, this jewel is actually a pastoral settlement, one of the very few preserved settlements of this size in Europe. The traditional trade mark are the shepherd huts with their typical architecture and covered with pine shingles. When you travel Slovenia, you will soon discover that old traditions are kept alive with great enthusiasm. 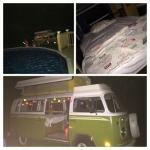 Even the younger generations are finding the old ways of living much more satisfactory in some cases. At the end of spring time cow bell jingles announce the arrival of pastors and their herds. 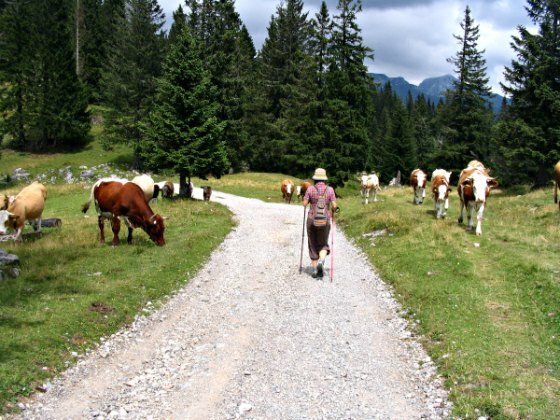 They stay up on the mountain until late September and aside from taking care of their herd, offer traditional dairy delights such as cheese, curd and sour milk. This is an absolutely great place for a fresh walk around the pastries, a longer hike around the mountain or a mountain bike tour if you're up for the challenge. The top of the mountain has regular connections with a mountain lift or you can walk all the way up by yourself from various locations. 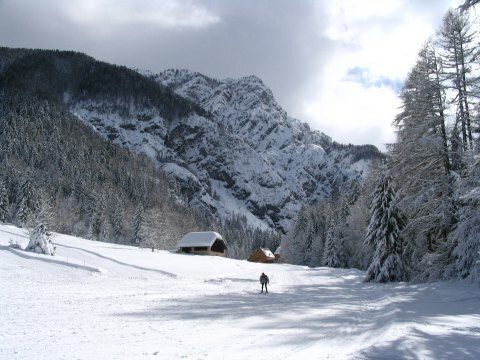 Logarska Dolina is also a part of the Kamnik Savinja Alps, but on the other side of the mountains, therefore a short drive is required to reach this wonderful region. This is one of Europes most beautiful glacial alpine valleys stretching in a U shape below the many mountains, some well over 2000 m. above the sea level. The valley is approximately 7km long and 250m wide and offers excellent hiking and biking opportunities in the valley itself or to the surrounding mountain peaks. An excellent cross-country ski slope is pulled around every winter and it's something I strongly recommend if you happen to enjoy this type of activity. The views are of course more then breathtaking and the many natural sights, including waterfalls, make this valley a real treat for nature lovers. The valley itself is sparsely populated with only 30 souls living in this pristine natural environment. The farmsteads have been here for centuries and the coexistence of man and nature is highly present and appreciated here. A rare value, difficult to find in these days. 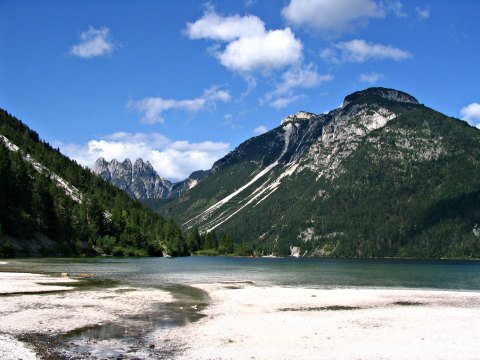 That is also the main reason Logarska dolina became a regional park of exceptional beauty and natural gastronomy. So when you travel Slovenia, this valley is more than worth a visit, especially if you're looking for some peace and quiet! All the way on the southern border with Croatia, the unique and picturesque river Kolpa separates both countries for a short while. Being the warmest in the country, it also offers numerous relaxing swimming opportunities. This is a totally different experience compared to the untamed Soča river in the mountains. Kolpa is far more relaxed, kind of lazy during the summer time and the limestone mountain peaks give way to rounded green hills and forests. Most of the hiking trails along the river are also suitable for cycling. If you need more adventure on the river itself, rafts and canoes are available for short and longer trips up to a week down the river. You can spend days, rafting or canoeing down the Kolpa river. Pack up your tent and the basic essentials and take it at your own pace. You can camp in one of the many sites available on the banks or the little gravel islands in the middle of the river itself. Get the fire going and enjoy the sounds of the peaceful river flow far away from it all. This is an area of outstanding biodiversity, therefore around 30 species of fish live in the river and well over a 100 species of birds occupy the air space. If your lucky, the pond turtle an otter or beaver might be seen. But the lynx, wolfs and bears will most likely avoid human presence because they travel Slovenia using their own routes. The valley of Kolpa is sparsely populated, therefore you can enjoy this peaceful environment as much as you wish. I'll repeat again, when you travel Slovenia, the quiet places are many, but they're never to far from a larger town, just in case you can't do without the modern world. Slovenia has lots more to discover as well. Take a stroll in the old towns of Ljubjana, Maribor and Ptuj. Discover the old shops, get a cup of coffee or hide in the museums or churches. Explore the Venetian style Mediterranean towns of Piran, Koper and Izola or visit Portorož, the hart of Slovenian seaside tourism. 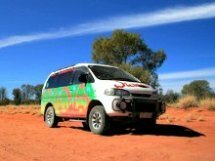 And of course take your time and discover as many of the back-roads of this beautiful country that you can. Enjoy a meal in a far away restaurant and enjoy the delicious homemade gastronomy and wine, which is proudly presented by the locals living in the country side. And like in any other country, when you travel Slovenia, it's all about the people living here and their heritage, which has a rich history. 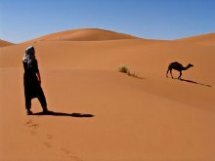 How often do you find a tiny country with only two million proud people living there and speaking their own language plus a variety of foreign languages? Not often, is it...And that is of course one more strong reason for visiting this country of diverse beauty. Once you travel Slovenia, you will find out, that it lies in the center of Europe and roads from all four sides pass right through this country. 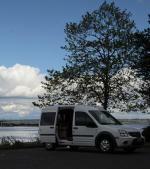 So if it happens to be on your way, try to find some time to really enjoy this country. Believe me, you will not regret!